Earth Rangers Centre for Sustainable Technology Showcase Are Leaky Doors and Windows Sabotaging Your Indoor Heating? Have you ever stood next to an old window in the winter? Or felt a draft from a door in your house? If so, you’re not alone – whether at home or work. 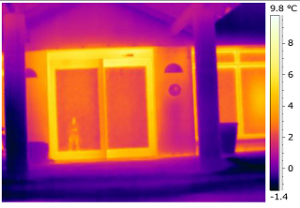 We recently addressed this type of maintenance when working through the LEED for Existing Buildings: Operations and Maintenance certification by performing a thermal scan of the building. Gratton Infrared, certified thermographers, took images of the exterior of the Earth Rangers Centre with an infrared camera. This camera recognizes temperature differences and shows them in a colour scheme that can be interpreted as heat loss (or gain). Note that interpreting thermal images takes experience, as some images show colours/temperatures that don’t seem to make sense. This can be a result of reflections, camera angle, outdoor conditions and other factors that the thermographer can identify. In some cases, the thermographer will adjust the scale of the temperature gradient to be able to visually identify all the elements in the image. Two exterior doors were noted as opportunities for energy savings and improved occupant comfort during the scan. The rotating door leading to the reception area and a metal door leading from the theatre to the outdoor patio were noted in our scan. Figure 1: Rotating Door – Note visible gaps under door seals. The rotating door had been a noted issue for years. Weather stripping needed to be adjusted weekly during the coldest parts of the year. Complicating this, the floor was uneven, so the seals really didn’t work properly. Also, the single pane glass in the door assembly bled heat out of the space. The result was that our receptionist needed an inefficient electric space heater to keep warm. Not ideal in a highly rated LEED building that’s known for its frugal use of energy! Figure 2: Thermal loss shown at joints and seals. We’d also had occupant complaints about the drafts near the metal egress door from the theatre. After mentioning this on a visit from our supporters at ASSA ABLOY, we decided to replace these doors and evaluate the performance improvements. 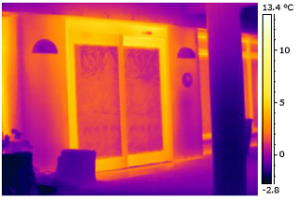 A thermal image of the rotating door was taken in March of 2011, with an outdoor temperature of 1.5°C. Figure 2 shows the result of one of these images. The white coloured areas indicate a surface temperature greater than 10°C. The temperature difference between this surface and the outdoor air enables heat loss through convection, conduction and radiation to the outdoor environment. Note that this image was taken when the door was in its ideal (locked) position. Under normal daily use, it was left in different positions, like in Figure 1, which would make heat loss and drafts worse. Figure 3 shows a similar image for a typical metal stiffened door on the building exterior. Note the “thermal bridging” evident as the bright yellow vertical stripes on the door. 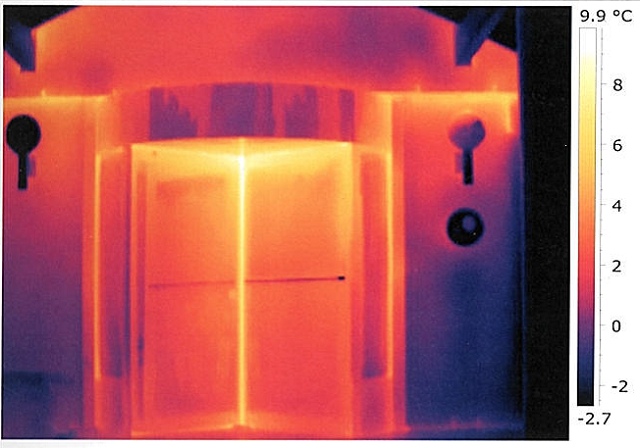 Figure 3: Metal door heat loss. The reception door was removed and replaced in September of 2013. Interestingly, the space above the rotating door did not have any insulation in it at all, resulting in the “hot” edge above the door in Figure 2. 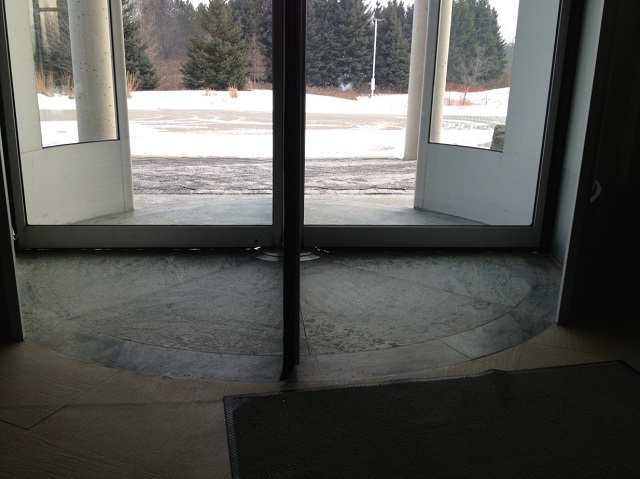 The rotating door was replaced with a Besam SL500 EcoDoor from ASSA ABLOY Entrance Systems. It features two sliding mechanisms, dual pane insulated glazing, magnetic latching and an interior vestibule. 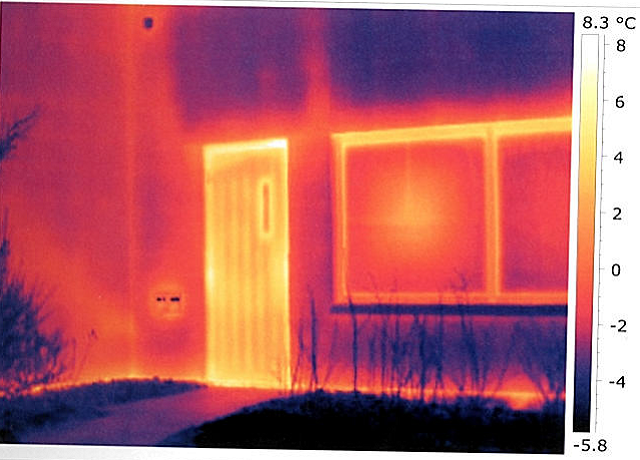 Figure 4: SL500 EcoDoor heat loss. Figure 5: Side angle of the new front door. 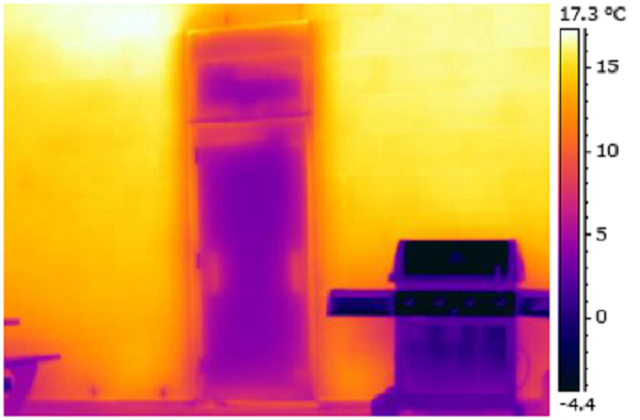 Immediately evident in the scan in Figure 4 are the cooler temperatures on the door surfaces. Note that there is almost zero leakage evident around the seals. In addition, the interior bulkhead was properly insulated and caulked this time, reducing the heat loss at the top of the frame, at the connection between the door frame and building. The glass temperature on the new door is also noticeably lower than the old rotating door. This is a result of higher quality, better insulating value glazing. The real proof of the success of this retrofit is the comfort level on the interior of the building. Drafts at the reception desk are dramatically reduced, to the point where the receptionist does not need the space heater to maintain thermal comfort. A similar pattern appears when looking at the thermal scan results for the TRIO-E door on the theatre exit. Figure 6: TRIO-E Door heat loss. When comparing to the door in Figure 3, the metal reinforcing bars are not visible, indicating better insulation value. Also, the seals around the door are not high on the temperature scale. They’re sealed well. This wall is south facing, and so this wall had been absorbing winter sun all day, warming it relative to the surrounding areas. This is why the wall seems so warm. The image was taken at 5pm, and the wall had likely not yet cooled from the late afternoon sun. Qualitatively, an occupant can now stand inside, beside this door, and not feel heat being wicked away from them by the much cooler door surfaces. The lesson you can learn from this exercise is that whenever possible you should use high quality, energy efficient components on your building envelope. 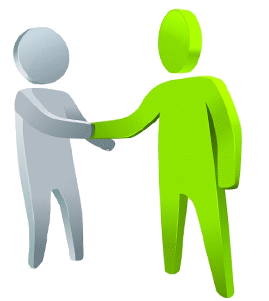 It will save you money as well as keep your building occupants comfortable and productive. An infrared scan every couple of years is a cost effective way to make sure that your building envelope continues to perform at its best, identifying possible problems before they become visually evident. You can learn more about ASSA ABLOY’s solutions on our building tour showcase.